for the blocks backing them. Valentine's Day seems the perfect time to write about "healing hearts". 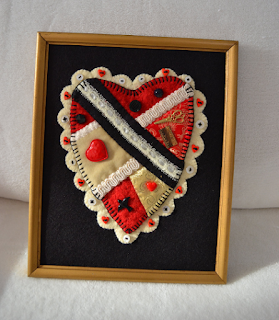 Heart wounds are part of everyone's life and I have recently acquired a new "heart wound". While I am not new to such wounds, I seem to be as vulnerable as ever to their pain. After much reflection, I think it is about my address book and my unwillingness to keep it in pencil versus permanent ink. Names are easily added but I have unrealistic expectations regarding ever deleting names. Deletions usually only happen if they are transferred to my prayer list after a loved one dies and I want to be sure that they make it to heaven safely! I prefer too, if my friends never move or change their address, or phone. I like sameness in my life. It makes me feel more secure, though I do white out addresses and phone numbers to correct them if changes occur. I trust others to take care and keep their friend list, as I do mine, at all costs save "losing my soul". I am learning, once again, about my self as I deal with my latest conflict with what I thought was a forever friend. I have learned that I delight in my friendships with others, though my limitations are very real and prevent me from seeing people in person as often as I would like. I still cherish them and reach out to them by phone or correspondence when I can't see them in person. I love them and I try to understand and be all I can be for them. I want to please my friends, likely too much. Its about loving them in the true Christian-agape-way! Am I a good friend? I would like to think so. I try to be, but I am also good to myself and work to meet my needs. I love others as I love myself and am likely guilty of "using my friends" to feel good about myself. I can only hope that it is mutual and that loving and giving to my friends is as good for them as it is for me. I try not to burden anyone but likely I am too human, even weak and quite expect friends to cut me the slack that I do with them. None of us are perfect! One of my friends refers to her friends as a "friendship garden" and I like to think of my friends as that, as they are indeed so beautiful to me. I am certain "my garden" has weeds and gets overgrown and needs care and manicuring. I usually leave any weeding to fate however. People die and/or move out of my life, making my friendship garden a bit sparse here and there and I try to make more friends to fill in these bare spots. Interests change along with values and, of course, those who know me well, know that I am opinionated which means I hang out in different mindsets, not to be mistaken for narrowness but rather convictions. I am Christian and conservative, albeit, imperfectly so. I am also a quilter as well, and am given to extremes of my hobby, not always so easy to take, especially if you are not a quilter or a fabricaholic like myself. Many scratch their heads and don't draw too close to my odd ways. Still others support me well and yet miss that I am not so willing to give up my limited sewing time to spend time on say "car or sporting events" and sadly I don't travel well, making me too much of a stay-at-home "Johnny-one-note"-person, commonly known by some as "unfun" or even "boring" and staunchly so! 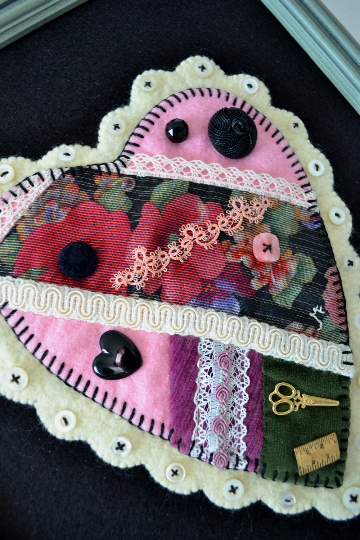 I do absolutely love to sew and also love all things fabric-related, like quilt shows and fabric or thread shops. But about heart wounds or losses of friendships, they hit me hard, no matter the cause as I value my friends and am at a loss as to how to deal with acrimonious endings. Friends that naturally drift away are relegated to my annual Christmas letter list or a phone call here and there, but to cross them out of my phone book and heart altogether just isn't what I do. Altercations are serious matters to me and I work hard to examine myself when they happen. I have faults and know that I can be out-spoken, especially about things that I believe in, though I do appreciate that others don't always share my beliefs and I try to respect differences. Variety in my friendship garden is good, but in today's world sometimes that is not enough. Extreme political polarization isn't uncommon these days and I am learning that some things that are intrinsically "Jane" must remain as self-chosen values that some people don't and won't value. It is with care that I choose to remain committed to them. I have also learned that loving another is a decision, not a feeling. Once this decision is made, I am loyal to a fault despite conflicts or differences, which I feel are no reason to cease loving someone. Heart wounds are deep and difficult to heal. My family and friends are the very fabric of my life and as a quilter none are insignificant or without purpose to my life's tapestry. I am grateful for each, past and present. Fortunately heart wounds are few and far between and I try to learn from them and grow. Their purpose is to refine and polish my rough edges and fault lines. They are precious to my life as they too have made me what I am, though their losses remain sad to me. There is a prayer process that I go through when I find myself at an impasse with a friend. I work to try to communicate carefully with those friends to work out our differences or at least agree to disagree. If they intentionally hurt me, I "will" myself to forgive and pray for God's help to to so. When angry with someone, it is too easy to let it fester and I have learned that such pain hurts me likely more than it hurts the person who is upset with me. I need to consciously will myself to forgive and through prayer, let God do the rest. I then pray for healing for my friend as well as for myself. Life is too short to harbor resentments, and mine is growing ever shorter all the time anyway! I need to release the pain and anger and give it to God. It isn't a one-step process but involves praying and re-praying whenever pain and anger rise within me. It has worked rather miraculously and sometimes the relationships heal and sometimes I simply heal and move on. Whatever happens, it is important for my heart to not become bitter and hard. This Valentine's Day, I wish you all a happy and healthy heart. Tend to whatever heart wounds you may carry and appreciate that no matter what, all our friendships, past and present, truly make us who and what we are, and don't allow yourself to become hard of heart and wall others out. Continue to be vulnerable and open with all its risks and potential hurts. When doors to others are shut and locked, respect their decision and pray for them. 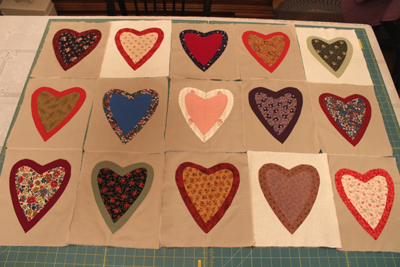 I love heart symbols and use many in my creations and even now am creating a new Appliqued Double Heart Scrap Quilt (see above) and am working to finish my mother's most beautiful candle-wicking, hand-embroidered "Flowers and Heart Quilt" that I featured in my last blog. I am offering two Crazy-Quilted, Penny-Rug Heart samplers as well as a framed wool "Primitive Penny-Rug Wall-Hanging" with embroidered saying. All are on sale this month through my blog. If you are interested please contact me. Each one is selling for $70 which includes shipping to anywhere in the USA. They would make a unique gift for a friend or loved one, or purchase one for yourself. Please contact me if you are interested. I have only three left, and will sell them on a first come, first serve basis, and do visit my Etsy store by simply clicking on Etsy Page on upper right hand corner of this blog! Happy Valentine's Day! Victorian Crazy Quilted Heart Sampler. 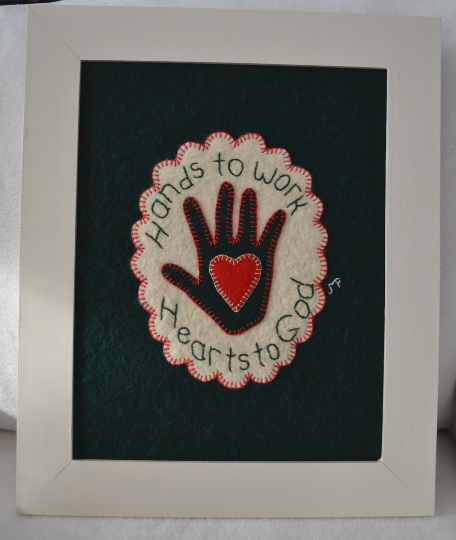 All hand-stitched. Measures 8.75" wide by 10.5" long (in frame). 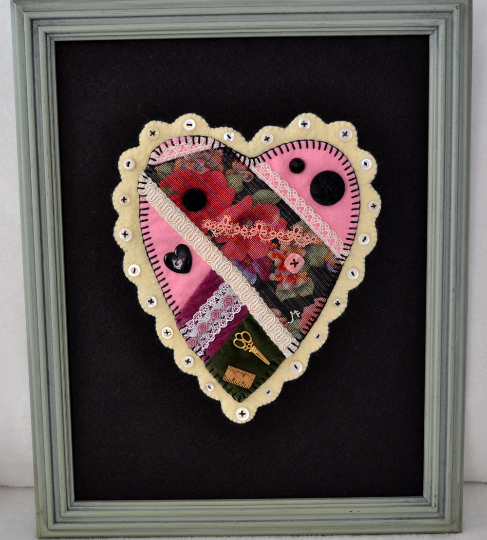 Victorian Crazy Quilted Heart Sampler. Measures 13.25" wide by 16.25 " long (framed). 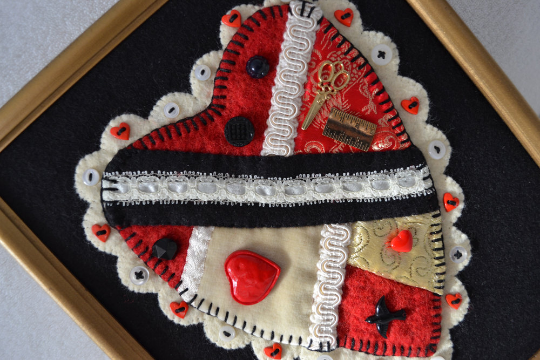 Primitive Felted Wool Penny-Rug Wall Hanging. All hand-stitched. Dark Green background. Measures 14.5" wide by 17.5" long. Framed.